Made from untreated 100% American hardwood from Maine, our teething rings are perfect for chewing, sucking, mouthing, and are eager to have drool all over them. Our teething rings are sanded smooth and sealed with our homemade beeswax sealer using only local ingredients. Put it in the freezer to make it cold or give it to your baby right out of the package. Your baby will be smiling from ear to ear with his new, great teething ring! Your set of three rings ships in a cotton muslin bag for easy gift giving and storage. 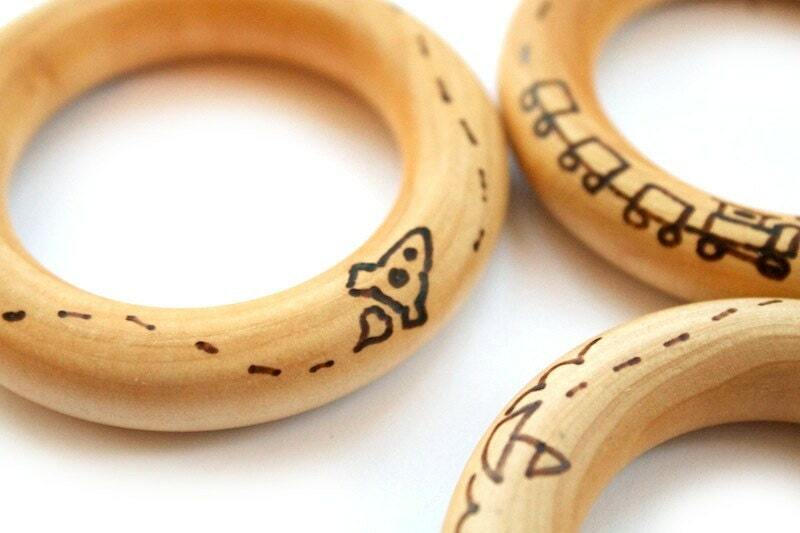 Your baby's teething ring is permanently branded with whatever pattern you would like. No ink, no chemicals, no toxins, no dies--all natural for your little one. Want to add your baby's name on the other side of the ring? Add personalization for only $2 for each ring! This is my second set of these teething rings. Both my sons have loved these!